Alzheimer's disease (AD) is the most common form of dementia in the elderly. The disease is characterized by a gradual loss of memory over several years duration. It is estimated that approximately 5-10% of the population over the age of 65 have at least some clinical features of AD. Of major significance to the aging population in the western world, is the prediction that the percentage of people with AD is expected to rise over the next 20 years. Considering the quality of life of our elderly and the cost of care for one person with AD is estimated to be $US 300,000, development of an effective therapy for AD is urgently needed. Because of its propensity to aggregate, Aβ builds up in the brain and assembles into amyloid fibrils, ultimately creating APs. There is now strong evidence that the formation of oligomeric Aβ is a key event in the pathogenesis of AD. Oligomeric Aβ has been shown to be toxic to neurons in culture. However, the mechanism by which Aβ causes cognitive decline is unclear. We are currently deciphering the molecular basis of Aβ-mediated neurite dystrophy with the aim of developing strategies to combat the cognitive decline in AD. CRMPs are a family of neuronal phosphoproteins,  which regulate microtubule assembly as well as anterograde vesicular transport of important growth-related molecular cargo along neuronal microtubules. , CRMP-2 has already been shown to be phosphorylated by cyclin-dependent kinase 5 (Cdk-5) at Ser522, , glycogen synthase kinase 3β (GSK-3β) at Thr514/509/Ser 518 , and also Rho kinase at Thr555, , all of which can mediate neurite retraction. Such phosphorylation disrupts the association of CRMP-2 with tubulin heterodimers, so that tubulin cannot be transported to the plus ends of microtubules for assembly, impeding directional growth of the neurite. Importantly, phosphorylation of CRMP-2 reduces its binding to kinesin-1 microtubule-related motor protein. Since, kinesin-1 is involved in anterograde vesicular axonal transport of molecules involved in synaptic integrity and plasticity (eg. BDNF) to the distal ends of axons,  phosphorylation of CRMP-2 is expected to alter microtubule dynamics. We were the first to show that, extracellular administration of Aβ can increase the level of phosphorylation of a threonine residue on CRMP-2. Furthermore, the threonine phosphorylation of CRMP-2 occurred concomitantly with Aβ-dependent RhoA activation and could be inhibited by a specific Rho kinase inhibitor (Y27632). Moreover, Y27632 administration to SH-SY5Y cells prevented neurite outgrowth inhibition induced by Aβ. Taken together, our results indicate that Aβ-activated Rho kinase initiates phosphorylation of CRMP-2. Moreover, our results suggest that Aβ-induced phosphorylation of CRMP-2 regulates neurite outgrowth inhibition. Our current research aims to (i) identify the Aβ-induced phosphorylation site in CRMP-2 and (ii) examining the validity of this notion. In the Tg2576 mouse model of AD, the levels of RhoA-GTP and CRMP-2 threonine phosphorylation are increased at 12 and 18 months-of-age correlating with the formation of neuritic dystrophy and increasing levels of Aβ in the brain. Collectively, these data suggest a Rho kinase-dependent mechanism by which extracellular Aβ oligomers potentiate neurite outgrowth inhibition. Despite the presence of other phosphorylated forms of CRMP-2 being identified recently in the cortex of AD brains and in the Tg2576 model, they were not significantly elevated above control. Moreover, the relationship between Aβ-mediated neurite dysfunction and the other phosphorylated forms of CRMP-2 (i.e. Thr509/514 and Ser522) has not been defined. It is now important to define, whether the ROCK II/CRMP-2 mechanism is the dominant pathway leading to Aβ-induced neurodegeneration, or whether the other kinases (Cdk-5 and GSK-3β) involved in CRMP-2 phosphorylation also play a significant role. 1. Small DH, McLean CA. Alzheimer's disease and the amyloid beta protein: What is the role of amyloid? J Neurochem 1999;73:443-9. 2. De Strooper B, Saftig P, Craessaerts K, Vanderstichele H, Guhde G, Annaert W, et al. Deficiency of presenilin-1 inhibits the normal cleavage of amyloid precursor protein. Nature 1998;391:387-90. 3. Sinha S, Anderson JP, Barbour R, Basi GS, Caccavello R, Davis D, et al. Purification and cloning of amyloid precursor protein beta-secretase from human brain. Nature 1999;402:537-40. 4. Vassar R, Bennett BD, Babu-Khan S, Kahn S, Mendiaz EA, Denis P, et al. 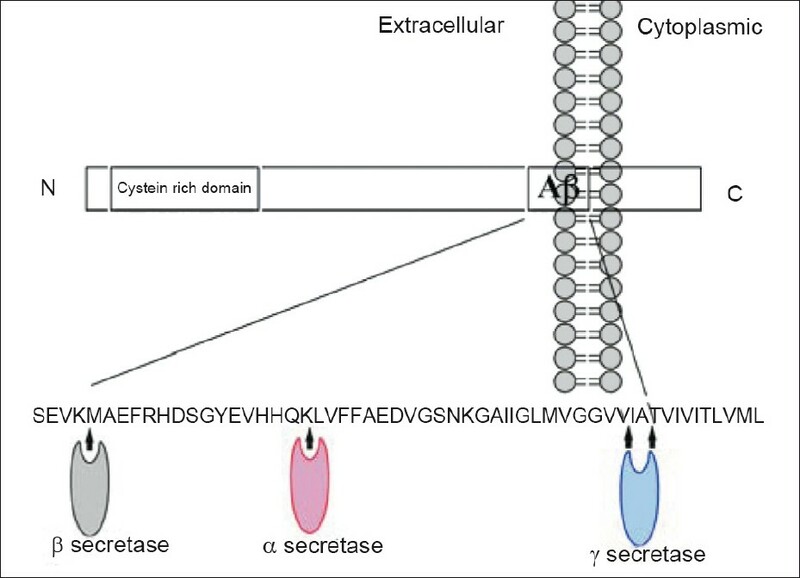 Beta-secretase cleavage of Alzheimer's amyloid precursor protein by the transmembrane aspartic protease BACE. Science 1999;286:735-41. 5. Walsh DM, Hartley DM, Kusumoto Y, Fezoui Y, Condron MM, Lomakin A, et al. Amyloid beta-protein fibrillogenesis. Structure and biological activity of protofibrillar intermediates. J Biolog Chem 1999;274:25945-52. 6. Demuro A, Mina E, Kayed R, Milton SC, Parker I, Glabe CG. Calcium dysregulation and membrane disruption as a ubiquitous neurotoxic mechanism of soluble amyloid oligomers. J Biol Chem 2005;280:17294-300. 7. Knowles RB, Gomez-Isla T, Hyman BT. Abeta associated neuropil changes: Correlation with neuronal loss and dementia. J Neuropathol Exp Neurol 1998;57:1122-30. 8. Tsai J, Grutzendler J, Duff K, Gan WB. Fibrillar amyloid deposition leads to local synaptic abnormalities and breakage of neuronal branches. Nat Neurosc 2004;7:1181-3. 9. Spires TL, Meyer-Luehmann M, Stern EA, McLean PJ, Skoch J, Nguyen PT, et al. Dendritic spine abnormalities in amyloid precursor protein transgenic mice demonstrated by gene transfer and intravital multiphoton microscopy. J Neurosci 2005;25:7278-87. 10. Näslund J, Haroutunian V, Mohs R, Davis KL, Davies P, Greengard P, et al. Correlation between elevated levels of amyloid beta-peptide in the brain and cognitive decline. JAMA 2000;283:1571-7. 11. Heredia L, Helguera P, de Olmos S, Kedikian G, Solá Vigo F, LaFerla F, et al. Phosphorylation of actin-depolymerizing factor/cofilin by LIM-kinase mediates amyloid beta-induced degeneration: A potential mechanism of neuronal dystrophy in Alzheimer's disease. J Neurosci 2006;26:6533-42. 12. Spires TL, Hyman BT. Neuronal structure is altered by amyloid plaques. Rev Neurosci 2004;15:267-78. 13. Small DH. Do acetylcholinesterase inhibitors boost synaptic scaling in Alzheimer's disease? Trends Neurosci 2004;27:245-9. 14. Postuma RB, He W, Nunan J, Beyreuther K, Masters CL, Barrow CJ, et al. Substrate-bound beta-amyloid peptides inhibit cell adhesion and neurite outgrowth in primary neuronal cultures. J Neurochem 2000;74:1122-30. 15. Petratos S, Li QX, George AJ, Hou X, Kerr ML, Unabia SE, et al. The β-amyloid protein of Alzheimer's disease increases neuronal CRMP-2 phosphorylation by a Rho-GTP mechanism. Brain 2008;131:90-108. 16. Buck KB, Zheng JQ. Growth cone turning induced by direct local modification of microtubule dynamics. J Neurosci 2002;22:9358-67. 17. Yuan XB, Jin M, Xu X, Song YQ, Wu CP, Poo MM, et al. Signalling and crosstalk of Rho GTPases in mediating axon guidance. Nat Cell Biol 2003;5:38-45. 18. Zhang XF, Schaefer AW, Burnette DT, Schoonderwoert VT, Forscher P. Rho-dependent contractile responses in the neuronal growth cone are independent of classical peripheral retrograde actin flow. Neuron 2003;40:931-44. 19. Mueller BK, Mack H, Teusch N. Rho kinase, a promising drug target for neurological disorders. Nat Rev Drug Discov 2005;4:387-98. 20. Sfakianos MK, Eisman A, Gourley SL, Bradley WD, Scheetz AJ, Settleman J, et al. Inhibition of Rho via Arg and p190RhoGAP in the postnatal mouse hippocampus regulates dendritic spine maturation, synapse and dendrite stability, and behavior. J Neurosci 2007;27:10982-92. 21. Hamajima N, Matsuda K, Sakata S, Tamaki N, Sasaki M, Nonaka M. A novel gene family defined by human dihydropyrimidinase and three related proteins with differential tissue distribution. Gene 1996;180:157-63. 22. Fukata Y, Itoh TJ, Kimura T, Ménager C, Nishimura T, Shiromizu T, et al. CRMP-2 binds to tubulin heterodimers to promote microtubule assembly. Nat Cell Biol 2002;4:583-91. 24. Uchida Y, Ohshima T, Sasaki Y, Suzuki H, Yanai S, Yamashita N, et al. Semaphorin3A signalling is mediated via sequential Cdk5 and GSK3 beta phosphorylation of CRMP2: Implication of common phosphorylating mechanism underlying axon guidance and Alzheimer's disease. Genes to Cells 2005;10:165-79. 25. Cole AR, Causeret F, Yadirgi G, Hastie CJ, McLauchlan H, McManus EJ, et al. Distinct priming kinases contribute to differential regulation of collapsin response mediator proteins by glycogen synthase kinase-3 in vivo. J Biol Chem 2006;281:16591-8. 26. Cole AR, Knebel A, Morrice NA, Robertson LA, Irving AJ, Connolly CN, et al. GSK-3 phosphorylation of the Alzheimer epitope within collapsing response mediator proteins regulates axon elongation in primary neurons. J Biol Chem 2004;279:50176-80. 27. Yoshimura T, Kawano Y, Arimura N, Kawabata S, Kikuchi A, Kaibuchi K. GSK-3 beta regulates phosphorylation of CRMP-2 and neuronal polarity. Cell 2005;120:137-49. 28. Arimura N, Inagaki N, Chihara K, Ménager C, Nakamura N, Amano M, et al. Phosphorylation of collapsin response mediator protein-2 by Rho-kinase. Evidence for two separate signaling pathways for growth cone collapse. J Biol Chem 2000;275:23973-80. 29. Arimura N, Ménager C, Kawano Y, Yoshimura T, Kawabata S, Hattori A, et al. Phosphorylation by Rho kinase regulates CRMP-2 activity in growth cones. Mol Cell Biol 2005;25:9973-84. 30. Kawano Y, Yoshimura T, Tsuboi D, Kawabata S, Kaneko-Kawano T, Shirataki H, et al. CRMP-2 is involved in kinesin-1-dependent transport of the Sra-1/WAVE1 complex and axon formation. Mol Cell Biol 2005;25:9920-35. 31. Cole AR, Noble W, van Aalten L, Plattner F, Meimaridou R, Hogan D, et al. Collapsin response mediator protein-2 hyperphosphorylation is an early event in Alzheimer's disease progression. J Neurochem 2007;103:1132-44.